Just how hard is it to make a good Star Wars game? Pretty damn difficult, based on the general track record. The best such games, like Knights of the Old Republic, Jedi Knight II, and Empire at War, have all been developed by outside studios; meanwhile, just about every title developed internally at LucasArts (in the past decade, at least) has been pretty rotten. I was really hoping that Star Wars: The Force Unleashed would be the game to buck both trends, as it had been pushed back a few times and seemed like a really promising title based on the demo released last month. I am sad to report, though, that The Force Unleashed is a stellar disappointment, and it breaks my heart to say so. At first glance, The Force Unleashed seems like it could possibly be the best Star Wars game with ties to the movies to ever appear. It has the best story I've seen outside of the original trilogy: the plot, serving as a bridge between Episodes III and IV, casts players in the role of Darth Vader's apprentice, Starkiller. Adopted by Vader as a child (after the Dark Lord of Sith slaughters the boy's father) and raised in secret, Starkiller is sent by his master on suicide commando missions against the last remaining Jedi across the galaxy. This is the story that fans deserved from the new movies and it's immensely more entertaining than Hayden Christiansen playing the role of Darth Emo. The pacing, character development, and narrative format is great, with artistic styling that's almost as good. But, sadly, these are the only good things about LucasArt's latest addition to the Star Wars Universe. You'd think a game starring a Sith assassin wreaking havoc couldn't go wrong, but The Force Unleashed goes very wrong in many ways. The game's camera constantly gets in the way, requiring frequent adjustments with the right thumbstick in order to actually see where the player is headed. The target-locking system doesn't work either, because even when you do lock onto an enemy, there's no guarantee that Starkiller will actually be able to hit his opponents with his lightsaber or force powers. 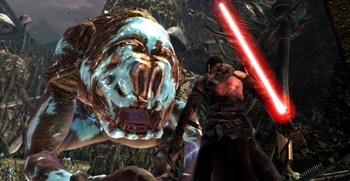 Aside from being able to do things like cast lightning, blast troopers through the air, and employ the classic Force Grip, Starkiller's other Jedi powers include: randomly throwing objects in the complete opposite direction you will flick the thumbstick, getting stuck in the scenery (requiring a reboot of the console), and doing a dead-on impression of a killer mime when he runs into the invisible walls that pepper environments. The invisible walls are the most frustrating part of the game, as they will often exist right up to a cliff edge and then disappear, which means that you never know when you're going to get knocked to your doom in the middle of a battle. There are a slew of other problems, too, such as how repetitive combat gets against the identical hordes during each level, the unavoidable quick time events against certain enemies, and some heinously long load times (even when you merely are going to the game's menus). However, worst thing about The Force Unleashed is how buggy it is. Aside from the aforementioned problems, I also encountered things like textures randomly popping in and out of view, a boss battle where my adversary's health bar disappeared (thus making it unkillable), and some severe instances of frame rate stuttering when the action gets particularly hectic. I'm not one to demand perfection from a game, but I do expect developers to be courteous enough to deliver a finished product that will not break and force me to restart my system. When a game is as promising as The Force Unleashed was, with all the extra marketing it received, it's more than a little disappointing to learn firsthand that it's not even as good an experience as the demo would have us believe. I wish that LucasArts had put together a better game, one that delivered a play experience as solid as the story provided... but more importantly, I really wish that I could get my money back. Bottom Line: Star Wars: The Force Unleashed, at least for the PS3, is a promising game with some majorly broken gameplay. If you're a true Star Wars fan, just watch the story unfold via the cutscenes when they get uploaded to YouTube. Recommendation: Do not buy this game, do not rent it. Developers and publishers need to be punished for putting forth broken games, and LucasArts should be reminded what putting forth drek like RTX Red Rock deserves. This review is based on the PlayStation 3 version of the game. Aaron Stack was going to be a Jedi, but the Sith had a better signing bonus.